Best DVD Digital Converter for Windows (10) and Mac to Convert DVD to Digital Copy Files as MP4, AVI, MPEG, MOV, etc. Any Idea of Best Free DVD Digital Converter for Windows (10)? How to Easily Convert Protected/Disney DVD to Digital Files on Windows (10) or Mac? It's rather bothersome to carry a pile of DVD discs with you on the journey. Also, you may feel upset when your precious DVD discs are scratched or damaged by naughty kids. Search for best fastest DVD digital converter to convert DVD to digital copy files with original quality for playback on iPhone X/8/7/6S, iPad Pro/Air, PC, Mac, Android, etc.? The famous WinX DVD Ripper Platinum would be a top choice, for its known virtue of fast, smooth, 100% clean and safe, as well as supporting all DVD copy-protections (incl. Disney X-project DRM). * Enable users to convert DVD to digital copy with identical quality on Windows (10) or Mac. * Rip DVD to MP4, AVI, WMV, MOV, MPEG, H.264 and many other video formats for easier playback on PC/Mac/iPhone/iPad/Android. * Support converting any copy-protected DVD (incl. Disney movie DVD) to digital video file by bypassing all DVD encryptions. * DVD conversion speed is No.1 fast. 2 hours DVD movie can be converted to digital file in about 10 minutes. What Can the Best Fastest DVD to Digital Converter Do? Below are the highlight features of this top 1 DVD digital converter, WinX DVD Ripper Platinum. As one of the best DVD rippers in market, it allows users to convert DVD to digital files like MP4, AVI, WMV, H.264, MPEG, MOV, FLV, MKV or other hundreds of popular video formats. In addition, it also provides 350+ output device profiles like iPhone X/8/7/7 Plus/6S/6S Plus, iPad Pro/Air 2/mini 4, Samsung Galaxy S8/S7/edge/Note 8, etc. 4 DVD backup modes are available for users to rip DVD to digital file with all intact DVD videos/audios tracks and subtitles, including 1:1 copy DVD to ISO Image file or DVD folder, copy DVD main title to MPEG2 file, and backup DVD full title to a single MPEG2 file only in 5 minutes. This powerful DVD digital converter can unlock all DVD region codes and copy protections like DVD CSS, region code, RCE, Sony ArccOS, UOPs, Disney X-project DRM. Therefore, users can resort to this program to rip newly released Disney DVD or rip any other copy-protected DVD to digital file with ease. This top DVD to digital converter can convert DVD to digital video with original quality at amazingly fast speed thanks to its built-in High Quality Engine, multi-core CPU (utmost 8) and Hyper-Threading tech. First of all, free download and install this 100% clean and safe DVD to digital converter WinX DVD Ripper Platinum on your Windows (10) PC or Mac (free download Mac version). Then follow the 1-2-3 simple steps below to convert DVD to digital copy file. Step 1: Import the source DVD disc. Launch this superfast DVD digital converter and click "DVD Disc" button on the top-left and it will auto load the DVD movie info and detect the right DVD movie main title for you. This smart software can rip protected DVD with 99 titles. Step 2: Choose the output digital video format. 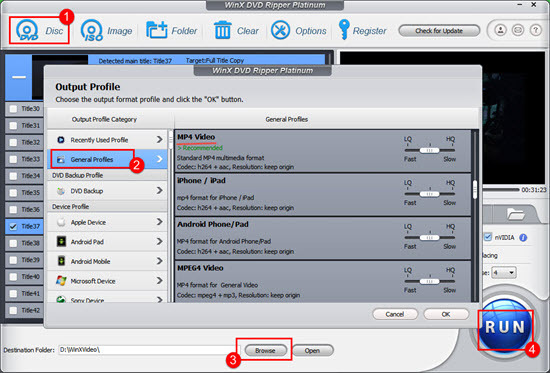 Browse the output profile window to select the preferred output digital video format for the DVD movie. If you want to watch the DVD movie video on iPhone iPad Android and most devices, MP4 is top recommended. Warm Tip: This top-notch DVD ripper also allows users to edit the digital DVD movie video. You can optionally click the wheel-like icon to adjust the video/audio settings according to your needs, for instance, change the video resolution, frame rate, aspect ratio, sample rate, etc., or click “Edit” button to adjust the volume, add subtitles, crop & expand the video to remove black bars, trim the video to rip a part of the DVD movie. Step 3: Start converting DVD to digital file. Click "Browse" to set a destination folder to save the digital copy file of DVD, and hit "RUN" to begin the DVD to digital conversion process. Enable users to convert DVD (any protected DVD) to digital file like MP4, AVI, WMV, MOV, MPEG, H.264, etc. at lightning speed for playback on Windows (10) PC, Mac, iPhone X/8/7/7 Plus/6S/6S Plus, iPad Air 2/3/Pro, Android Samsung Galaxy S8/S7/S7 Edge/Note 8 and many more.